This summer Joe and I celebrated our 10th wedding anniversary. Whenever our anniversary rolls around, I find myself reminiscing. Not only about the wedding day itself, but all of the planning that led up to our special day! Sure, there were some stressful times. Every bride faces some sort of stress while trying to juggle wedding planning along with the duties of every day life. That's what the bachelorette party is for! A night of fun for the bride! A night out with the girls! While our wedding and respective bachelor/bachelorette parties were small, I wish there was a company around like The House of Bachelorette at the time. A website that offered a variety of different bachelorette party favors to fit any bride type! Not every bride is looking for a "Magic Mike" type night out! For me, the perfect pre-wedding party was a quiet dinner at a fancy restaurant with my closest friends. Ten years ago it was difficult to find bride-to-be items that would have been welcome in that sort of venue! The House of Bachelorette offers a wide range of party favors appropriate for both low-key brides (like me) and those looking for some more risque, blush-worthy items! The prices are great, too! 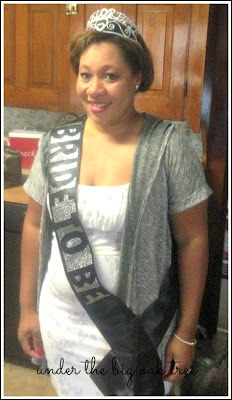 Recently, The House of Bachelorette sent me their Super Glam Bride Rhinestone Sash to review. This is something I would have loved to have worn on my night out on the town with the girls! The satin sash is the perfect addition to any outfit and is studded with beautiful-shiny rhinestones announcing the guest of honor as the bride-to-be! It's also available in 6 colors and is shipped in a pretty organza gift bag! Since my bachelorette days are long behind me, I gifted the Super Glam Bride Sash to a friend that was planning her pre-wedding girls' night out! Disclosure: I received this product for free from The House of Bachelorette in exchange for an honest review. All opinions in this post are honest and my own.